Written on June 23, 2006, and categorized as Secret and Invisible. 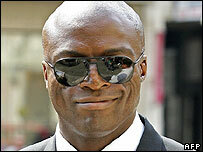 I see that my old chums John Wadlow and Seal have been subject to a high court ruling, which means Seal will have to part with a minimum £500,000 in unpaid commission. However what I found most interesting was the Judge’s assessment of the two men’s reliability as witnesses. He added that Mr Wadlow had “felt himself entitled” to share in Seal’s success once he became an international star. Mr Justice Gray ruled that in relation to the 1990 management agreement Mr Wadlow had “misused his influence over Seal”. But the March 1995 agreement was “plainly not procured by undue influence”. John’s “undue influence” was to a certain extent reciprocal. Seal was and no doubt is an immensely charming man who could persuade you of his rectitude with a compelling combination of passion, wild analogy and twisted logic. John in fact was one of the few people in his life who was strong minded enough to resist. At one point, John and his partner Julian had invested thousands of pounds of studio time in this gifted singer and performer, who promptly buggered off to Thailand for six months “in order to find himself” which pissed them off not a little bit. When Seal got arrested and made a pleading phone call for them to bail or bribe him out, John decided this was the perfect opportunity to teach him a lesson and kept him languishing there for two weeks in order to make him more appreciative.